Much has changed since this image was taken, although much also remains. 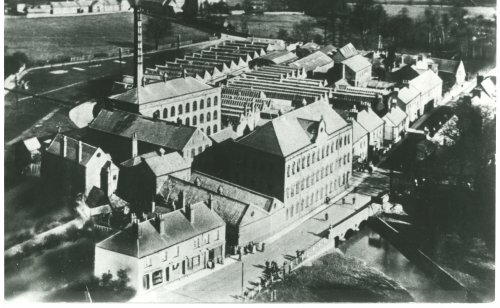 Many of the buildings fronting onto the main road have gone including the large mill building. The second mill (near the tall chimney) still stands and is now apartments; the roof was lowered by removing the top floor in the 1990s. A tall chimney on the Wright's Mill site was demolished in the 1990s, although it's not the one shown in this photograph. The Stafford Orchard can be seen upper-left and the old Primary School top-left. A picket fence runs alongside the path in the park defining the two areas of land that we now see as the present day park. This image was used on an advertising postcard for Wright's elastic webbing factory.